Hi it's me again. I just found red spots on my legs right now and i don't know what this means. My legs have been hurting for years now... I went to a doctor once about 2 years now and she said it might be neuropathy. I undergone tests to verify if it was indeed true but the tests showed normal activity for both of my legs. now i don't know if the pain and the spots are related to each other. If anyone has an idea on this, please let me know ASAP. The spots look like bruises except when you look closer they're actually grouped small dots.. Please let me know of your ideas. 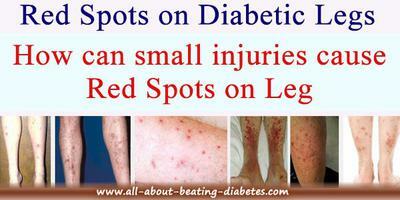 Red spots on diabetic legs may appear because of trauma. Normally, when trauma (hitting against something,etc) occurs, the place on your skin will turn from red to black and finally yellow until the color of your skin. More younger one is, the fastest the results. If the same trauma is caused in diabetics, this "healing" process will take time to occur, that is why you see persistent red spots on your diabetic legs. Another suggestion I want to give is do some liver tests to see its function. Furthermore, do regularly check your legs and feet and get the appropriate treatment. Itchy rashes and spots related to insulin allergy?. What to do when your legs hurt?. How to help beating my diabetic mom’s leg pain?. How to recognize the itching skin is of diabetes?.